Making news of late, (and we mean real news, not just 'designy/brandy' news), is the Government led initiative, Australia Week in China, which sees Prime Minister Tony Abbott's delegation of more than 700 representatives from 564 organisations, cross the seas and embark on Australia's largest ever trade mission to China. Re worked with Austrade to develop a brand to support their trade mission of milestone proportions. This included a launch mark, 'Australia Open For Business' and the 'Australia Week in China' brand itself. The brands took cues from the existing Austrade palette and maintained a consistent front for Australian trade in foreign markets. With the mission visiting Shanghai, Beijing, Chengdu, Guangzhou and Hong Kong, bilingual iterations were developed for each of the relative cities, along with a host of executions for large scale livery and collateral. Debuting in full floor to ceiling style, take a peek at the brand here, and find out more about the mission below. 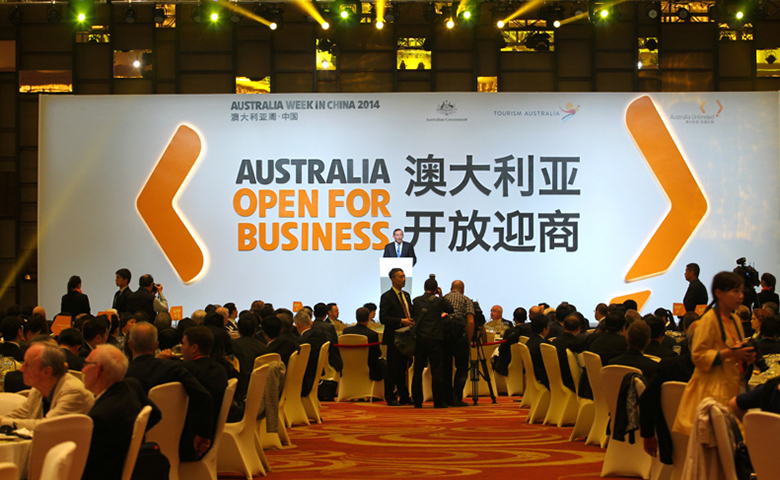 "I'm pleased to support the launch of the Australia-China BusinessWeek. Australia's relationship with China is going from strength to strength and at the heart of that relationship is trade.China is Australia's largest trading partner, not just in resources, but also in services and agriculture. Trade means more jobs and a stronger economy." (The Hon. Tony Abbott MP, Prime Minister of Australia).